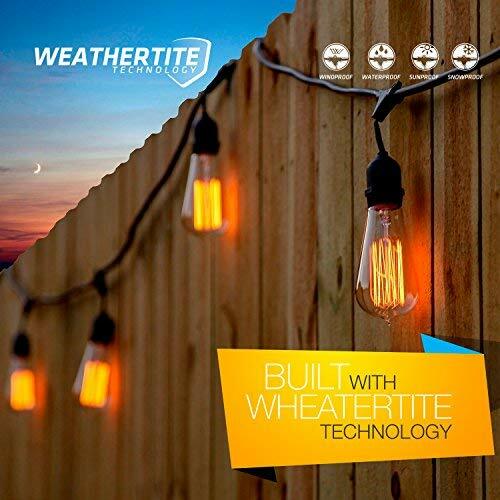 Brightech's Ambience Pro Outdoor Lights feature WeatherTite technology, we built the wire with extra levels of protection against the elements. 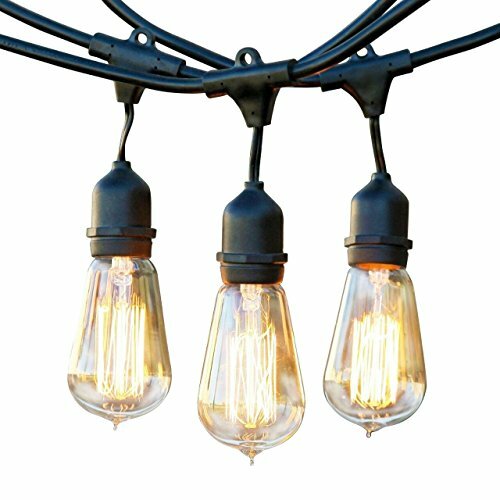 We wrapped it in a strong rubber casing of premium quality construction, so our outdoor string lights will hold up to the harshest weather. You can leave them outside all year long, even during bitter cold winters. Rain will fall and wind will blow, yet these superior quality weatherproof light sockets are strong enough to withstand the wear and tear of outdoor use year after year. The two-prong socket connects up to 2 light strand sets end to end when using the included Edison filament bulbs. Casting a soft amber glow, these lights give dusk hours a cozy aura. The 30 inch spacing between each vintage-style bulb extends a luminous effect across the sky, reminiscent of fairy lighting. There's approximately 3 feet between the power plug and the first light. 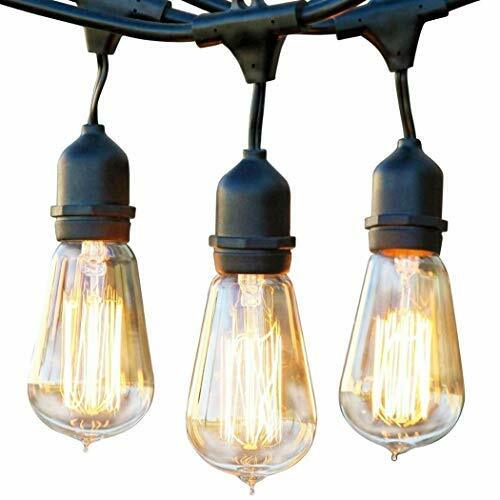 Ambience Pro Vintage Edition Lights enhance the al fresco dining atmosphere in a sidewalk café or your own backyard. The warm yellow bulb filaments provide the perfect balance of ambience and illumination for romantic tranquility with enough light to dine by. From winter holidays to wedding receptions to lounging outside on a summer night, decorating with these nostalgic yet mesmerizing bulbs (15 per strand) transports you to a different time and place. 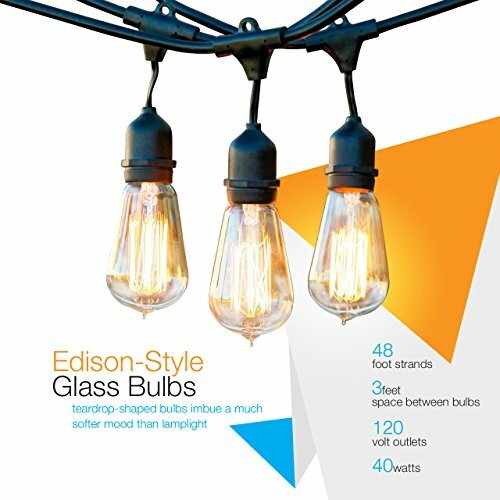 Ambience Pro Vintage Edition Lights weigh 11.3 pounds and are packaged securely with bulbs wrapped and stored separately from wires (search for B00NP9ZWZQ on Amazon for replacement bulbs). Install strand with sturdy materials such as galvanized steel 14-gauge guide wires, eye hooks, or zip ties. Plug-in to power via 120v outlets. For greater lighting versatility, this strand may be paired with a timer and an outside dimmer with a 600 watt capacity. DIMMABLE PATIO LIGHTS TRANSFORM YOUR BACKYARD INTO AN OLD ITALIAN CAFE: Enjoy bistro ambience on your deck with plug in teardrop string lights. The classic look is just right for casual events like a BBQ or formal ones (eg weddings). The ropes are bright enough to grill and eat by, yet dim enough so you're not overwhelmed. They're also incandescent and can go on a dimmer (sold separately). GAZEBO LIGHTING WITH RETRO EDISON STRAND LIGHTS - GIVE YOUR EXTERIOR A CARNIVAL LOOK: Festoon your balcony with the best rope lights around: those that hearken back to the early days of electricity. Our classic bulbs' filaments bring to mind early American inventors like Edison and Tesla and create party atmosphere! Connect up to 2 strands. 15 bulbs are 36" apart. COMMERCIAL GRADE WEATHERPROOF, HEAVY DUTY OUTSIDE LIGHTS - These industrial grade back yard lights are so durable thanks to Brightech's WeatherTite (TM) technology. The rubber casing is thicker than other brands and envelops the sockets to keep water out. Brightech Ambience Pro strings have withstood 50 MPH winds, per reviews! VERSATILE: WORKS INDOORS (EG BEDROOM FASHION) AND FOR OUTDOOR PARTIES: Wire up a decorative canopy for a wedding reception or run these electric lights around a four-poster bed. The choice is yours! --- BRIGHT & DIMMABLE: Bright enough to grill and eat by, yet dim enough so you're not overwhelmed. Bask in the glow of warm white (3000K) light. They're also dimmable with a dimmer (sold separately). SATISFACTION GUARANTEED WARRANTY: Our goal at Brightech is to provide creative, innovative, and beautiful lighting so that everyone can have quality, high end lighting in their home. We proudly stand behind all of our products 100%, which is why we offer a full 3 year warranty on the strand and a full 3 month warranty on the bulbs. If for any reason you are not satisfied with your purchase, please contact us because our number one goal is customer satisfaction.